Got a year you want to remember such as a wedding or a graduation These sets make the perfect gift idea for birthdays, anniversaries, holidays and so much more. 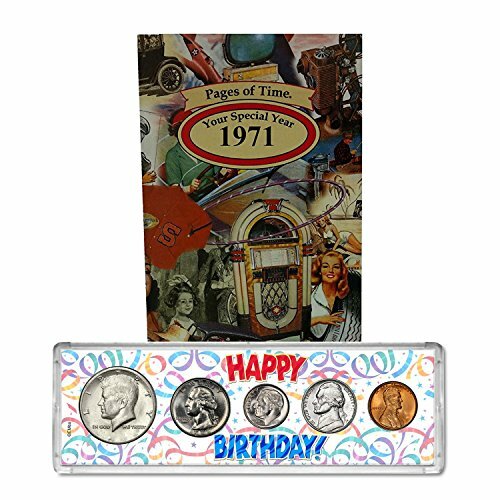 Every set includes a one cent piece, a nickel, a dime, a quarter and a half-dollar. All coins are genuine and of the highest quality at an affordable price. All five coins are encased in a hard-plastic holder and includes a certificate of authenticity. Included with each coin set is a pocket-sized fold out card that highlights cost of living, top sports teams and much more! Set, card and certificate will be packaged in a self-sealing cardboard envelope that can be mailed first class. Actual coins will vary from the stock photo. We have edited our photos to show samples of the coin design minted for that respective year. Please take note that coins will be left in their natural condition and have not been cleaned or altered. Centerville Coin & Jewelry Connection Inc., is in southeastern Ohio. The company was recently honored with the Better Business Bureau Eclipse Integrity Award and have over 46 years of experience in the numismatics industry. The products are hand assembled in our warehouse in Ohio.